We're here to make your home an oasis. Rely on the dedicated professionals from Ambrose Heating & Air Conditioning for a full range of heating services throughout East Dundee, IL and surrounding areas. Ambrose Heating & Air Conditioning is the right choice for air conditioner installation, upkeep, and repair across East Dundee, IL and surrounding areas. Clean air is important to a healthy home. Not only can your indoor air impact your health but it can also impact your comfort system's performance. Speak to an expert today! Providing superior solutions to residential and light commercial temperature control in East Dundee, IL and surrounding areas, Ambrose Heating & Air Conditioning simplifies the challenges of local weather. Contact us at (847) 496-3352 for expert installation, seasonal maintenance, and repair, and let our highly trained professionals optimize the performance of all makes and models of heating and cooling equipment. Through meticulous and proven service procedures, we ensure peak energy efficiency, more evenly distributed comfort, lower sound levels, greater reliability, and sustainable operation. Family owned and operated, Ambrose Heating & Air Conditioning prioritizes the value of your energy dollar. 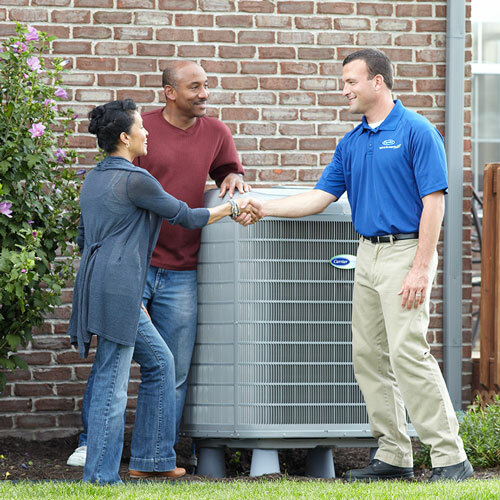 Specializing in Carrier brand products, we offer a complete range of industry-leading, ENERGY STAR rated residential and commercial HVAC systems, catering to your specific requirements and taking advantage of the innovations that trim costs, enhance comfort, and add convenience to everyday life. Our fully licensed and insured technicians are prepared for any job, completing all work without unnecessary delays, disruption, or damage to your property. Upholding an A+ rating from the Better Business Bureau, We Guarantee Quality Workmanship throughout East Dundee, West Dundee, Lake in the Hills, Algonquin & Hoffman Estates, IL.